Cottage, 2 Bedrooms, 1 Bathrooms, (Sleeps 5). Full kitchen, bathroom, laundry. Wonderfully private bach retreat close to Matakana, at Baddeleys Beach. Short walk to Baddeley's Beach reserve only 2 minutes away (Campbell's Beach 10 min walk). Both beaches have safe playground facilities for children. Only 55 minute drive from Auckland Harbour Bridge. Elevated pictureframe view through native bush out into Kawau Bay. Extensive decking area which adds to indoor/outdoor living. 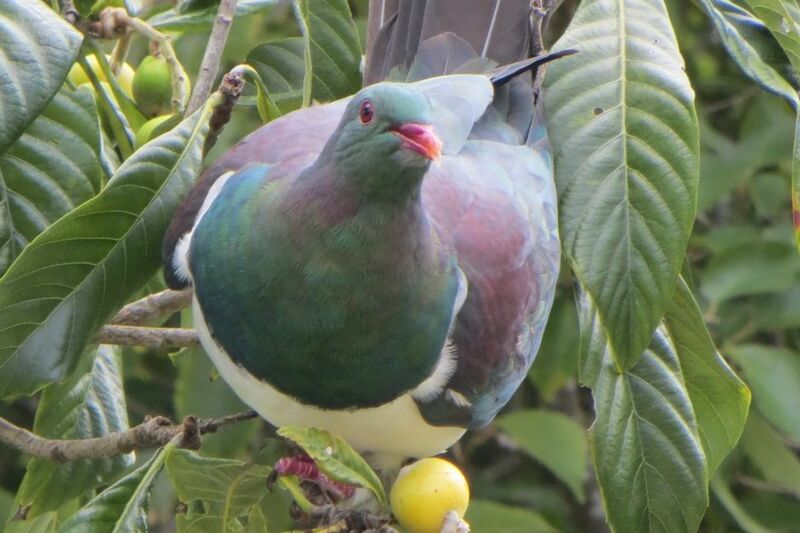 Enjoy the native bird life that abounds in the adjacent pigeon (kereru), tui, bellbird and occasional kaka. Modern bach fit out and facilities, and gas BBQ on deck. Great location within a few minutes of many local attractions including Matakana village and Farmer's Market, cinemas, galleries, Ascension vineyard and numerous other wineries, Brick Bay sculpture trail, Tawharanui and other regional parks, Goat Island, Sawmill Cafe, Sandspit/Kawau ferry, and golf courses at Omaha and Warkworth. Six night minimum stay from 20 Dec to 20 Jan.
Two night minimum stay other times. 10% off stays of 6 nights or longer (except peak times). Welcome to arrive from 3 pm on first day. Departure by 11 am unless agreed otherwise. Remove rubbish and leave tidy as found. Linen available on request at additional cost. Central to Matakana and surrounding area. Bach is located up private ROW and surrounded by native bush and bird life. Picture Frame view out into Kawau Bay from bach. Property backs on to rural setting with sheep paddock, native bush valley. Picture frame view through native bush out into Kawau Bay. Table seats four as standard. Two additional chairs provided. Extensive decking surrounding 3 sides of bach. Partially covered. Washing machine and wash tub provided. Thank you, John. We had a very pleasant stay, loved the bush setting and birds. The cottage was comfortable and well equipped, although would be cold in winter with just the one heater. Great to hear you enjoyed your stay. Have noted your comment re winter heating. We are planning to install a heat pump this next month. Thanks again for leaving bach in good condition and providing constructive suggestion. Nice place, beautiful location and good base to explore the area. Peaceful setting with a stunning view. And it was lovely hearing the sounds of the native birds. John was very quick to reply to emails and very attentive to our needs. Thank you John! We are Looking forward to booking again in the future! Tidy place with everything you need. Beautiful views, clean house very well set up. Clean & tidy. Good place to base yourself.